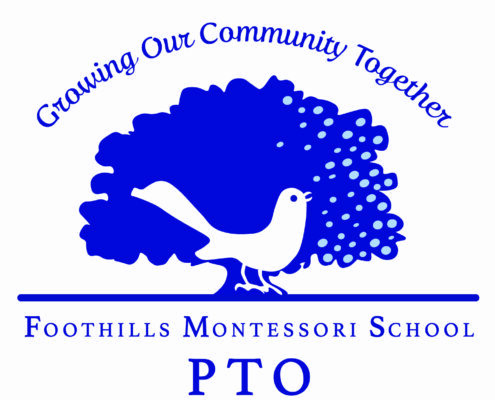 The Parent Teacher Organization (PTO) at Foothills Montessori School is comprised of Parents, Teachers, Guardians and Administrators, who are committed to promoting activities that enrich the education and social experience of FMS Students. From the inception of the school, the PTO has created memorable community building events that drew in generous donations and nurtured tangible connections between families and their children. Many of the early friendships formed at PTO sponsored events have blossomed into lifelong relationships, even after their children have graduated. Participating in the PTO can be as simple as volunteering for one of the events, to taking a bigger role as a PTO Board member. Officers are selected in May and typically serve a two-year term. Parents can also volunteer to represent their child’s classroom, or serve as a liaison between the PTO and the classroom parent. If everyone helps a little, a lot gets done! For more information and to stay current on all of the PTO’s activities, current parents receive a monthly e-newsletter called “The Loop” and all can connect to the FMS PTO blog at: fmspto.com or email us at fmspto1@gmail.com. For more information on how you can get involved, please contact fmspto@gmail.com. SignUp Genius makes it easy to sign up for volunteer opportunities at FMS. Click here to create your account today.